Moving between Canada and the United States has its own set of challenges. You want to make sure the company to handle your goods not only knows the challenges you face, but knows how to get you through them – hassle free. Whether you are moving to take a bite out of the American pie or to the true north, strong and free, Kenwood is a Montreal moving company that knows how to get you there. With our dedicated cross-border fleet, we not only have the knowledge, but also the qualified, security checked staff to make it happen. 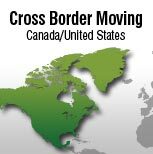 The proper handling of customs issues in both Canada and the United States is a critical part of a successful cross-border move. Our trained and qualified staff is here for you to ensure that your goods arrive with the proper documents and through the correct procedures so they arrive on time and trouble free. As always, we do this with care – Kenwood Care.